Sally and I talk about fiber preparation a lot. Conversations usually start off with a confession. OMG! Where did these come from??? 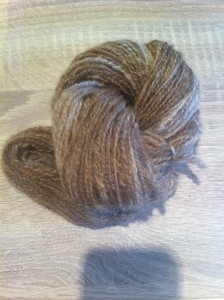 Then we discuss all the processes we could use to turn the raw fleece into The Ultimate Yarn. There’s scouring, combing, carding, dyeing and blending. Then there are infinite techniques–have you heard of the Fermented Suint Method for scouring fleece? Do you card your fleece or comb it? Do you put your fiber into the drumcarder sideways? Last fall, after buying a few more Shetland fleeces I was so excited to try them out on the wheel that I pulled off some locks and started spinning. No fiber prep at all. Spinning in the grease isn’t something I usually do, but a lot of spinners do. These are the people who look at you funny when you start talking about scouring fleece and the other fifteen steps you’re going to take before you spin any yarn. What I learned was spinners who advocate spinning in the grease have a point. One is, if you have a beautiful fleece with nice crimpy locks, it’s a shame to process that out. It’s fine just to tease the locks out a little with your fingers and start to spin. I would recommend, however, picking through the fleece first and removing the dags (poo) and larger bits of vegetable matter. You don’t want that. Here’s some Shetland spun in the grease. 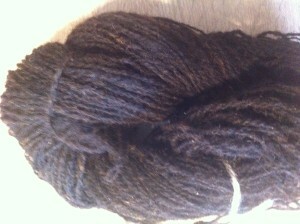 The yarn plumped up nicely after washing. Here’s some Zwartables I spun in the same way. Yes it is a bit smelly and you should clean your wheel afterwards. Really the final result is the same as if you’d spent days scouring and carding and combing and all the rest. Safety Note. You do need to be careful handling raw fleece. Pregnant women should not handle raw fleece. 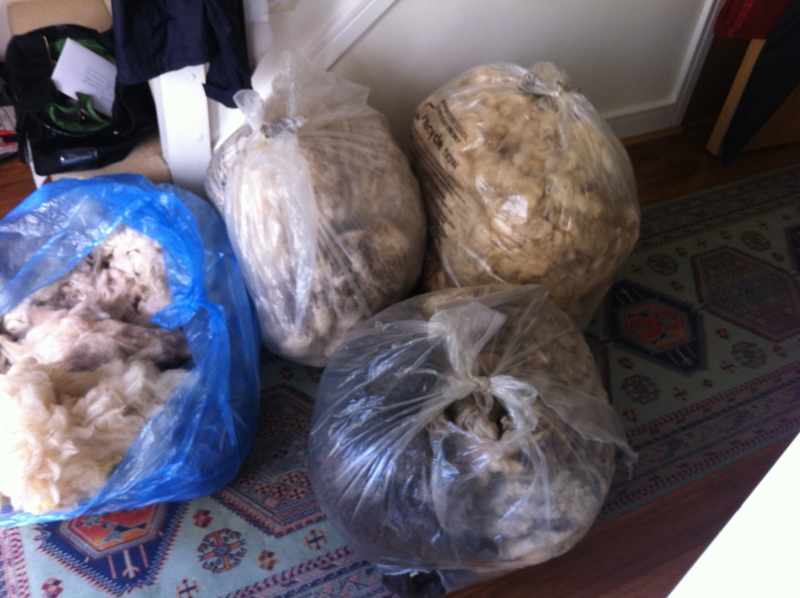 Be aware that raw fleece is likely to have sheep excrement on it–so avoid handling that with bare hands. Choose from the sections of the fleece that’s not near the animal’s rear end. Give your hands a thorough scrub when you’re finished. Then wash them again! What’s great about it too is that you can get a corespun effect without any additional effort, the locks are already there. It’s probably worth noting that this works really well for more heavily-greased fleeces, and when they are newly shorn, before the lanolin gets sticky. And great for conditioning your hands! I’ve tried pulling apart fleece and gently washing the locks to keep that raw fleece look, but it only really works with longwools. 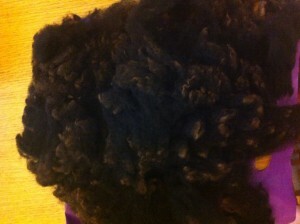 When I first tried spinning in the grease I did seriously question why I have spent so much time scouring fleece. I’m still not sure why. I think it’s because we dye in the wool a lot. We need to try dying plus scouring at the same time, to save a step. Alternatively, we need to start dying spun yarn. 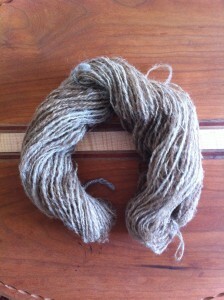 If you put your crimpy washed locks through the drum carder sideways, you can retain that crimpy look. Blog post to follow!